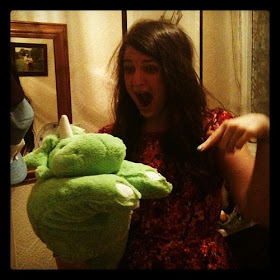 t*rexes and tiaras: what makes you super? I've got to admit, I've been struggling quite a lot with my appetite recently. I think it's down to the sunny weather. I just haven't been able to eat very big portions of anything, and despite the fact that I usually go to the gym a couple of times per day (once to swim and then again after work to either do a spinning class or a gym workout) I just haven't been feeling hungry at all. I know this means I don't eat enough, particularly at the moment. So when I was asked if I'd like to try out some of the products from the Linwoods Superfoods range, I jumped at the chance. I guess I should also admit that I'm fairly hopeless when it comes to actually going food shopping, so more often than not, my cupboards have just the basics. 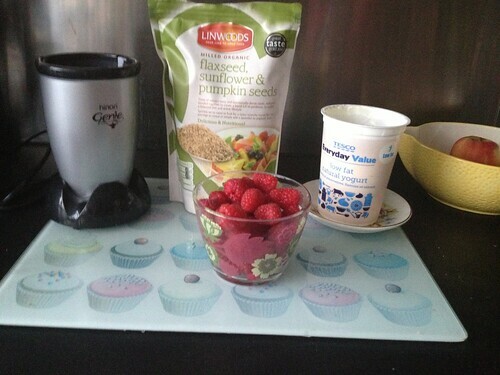 When I come to make a smoothie or something, I often wish I was more organised with some of the seeds and ingredients which people seem to add to theirs. I tried out this bag, which was quite a good choice for me, as I like all of the ingredients and there wasn't anything too nutty in there. (Whilst I'm not allergice to nuts, I don't like the taste of them, so anything which has an overly nutty flavour tends to get avoided by me. I've been trying to up my food intake, so things like smoothies have been a favourite this past week when I haven't wanted a proper meal. 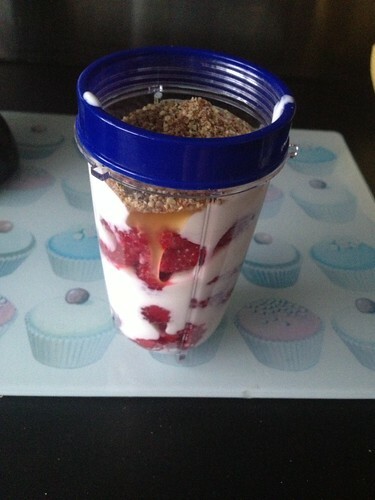 I picked up some raspberries the other day and thought I'd throw them into my smoothie maker with some natural yogurt, a spoonful of manuke honey (which my Nan is always buying me to try and help my stomach pains!) and a couple of tablespoons of the seed mix. 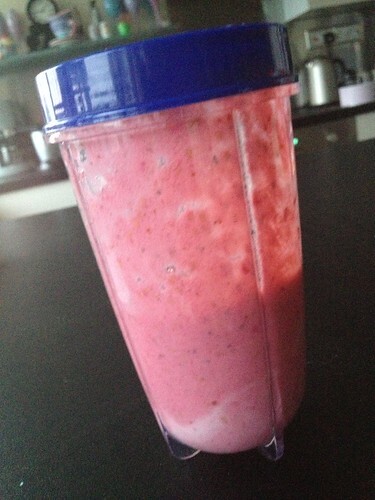 It made a rather yummy smoothie, which I'll definitely make again. The other thing I've discovered this week is "overnight oats", following a conversation on Twitter about them the other evening. I thought I'd give them a go. They really couldn't be simpler. 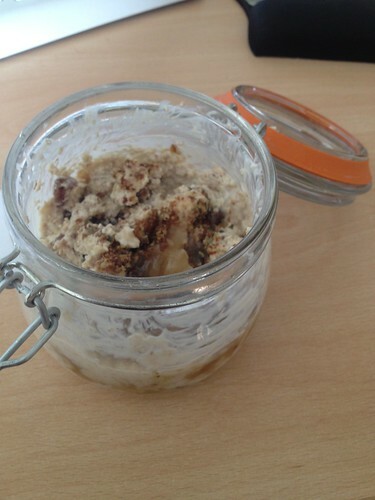 A mixture of yogurt (I think most of the recipes say use milk as well, but as I don't drink it, I never have any - yogurt works fine on it's own, it just makes for a thicker consistency), porridge oats, raisins and another spoonful of honey, topped off with the seed mix. Leave them in the fridge overnight and don't forget to take them to work with you in the morning (I almost left them behind!). Very nice and I've tried them again since. 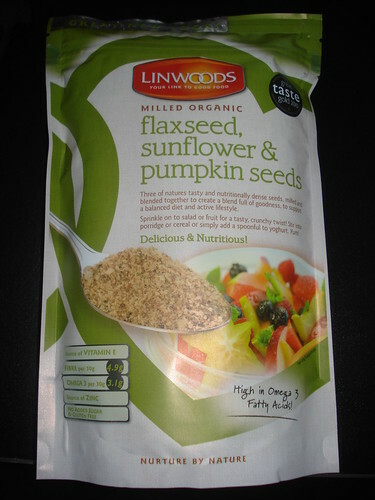 I've been looking at the health benefits on the Linwoods site and definitely think these mixes are going to be a great way for me to get some more goodness into my diet. I'd totally recommend them. 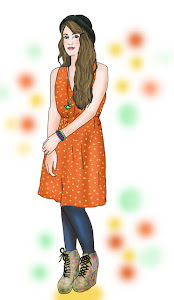 The brand have a facebook page as well, which you can find here. I like to pop plain flaxseed that I pick up from Aldi into my porridge in the mornings, once I get into work. I also love adding chia seeds to things too, I pick them up from a local scoop and weigh place in Worthing.